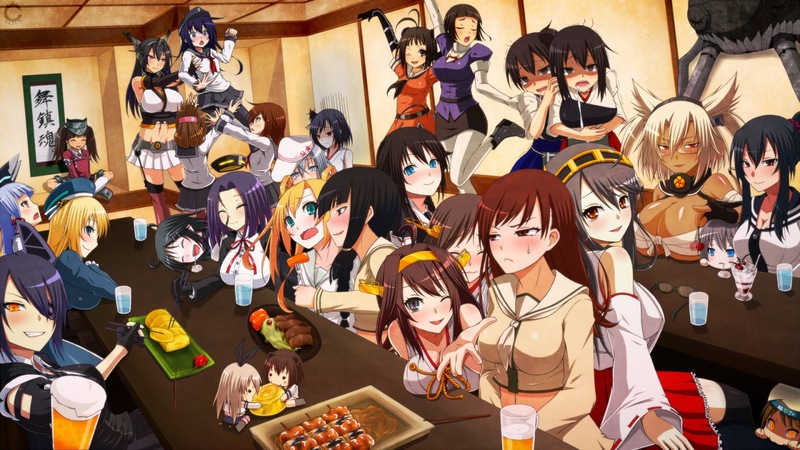 Posted on March 30, 2015 by Lena K.
Initially, Kantai Collection or KanColle is a free to play web browser game in which you form your own fleet, collect ship girls and fight against the evil abyssal fleet. The anime is not much different, but we don’t experience this adventure through the eyes of the admiral, like we do in the game, but rather from the standpoint of the special destroyer Fubuki, as well as many other fleet girls. Just like in the game, the girls fight against the evil abyssal fleet in order to gain back territory and ensure the worlds’ safety. In case my short description doesn’t make it obvious already, let me just make this one thing clear to everyone; You’re watching a show about girls in skimpy clothes that are supposed to be real ships, fighting other girls and some random sea monsters. In all honesty, that just sounds ridiculous and stupid. Though, that being said, I still can’t deny that I enjoyed this show with a burning passion. So let me explain to you how a show with a setting as ridiculous as this, managed to score as my favorite show of the whole year so far. First of all, let’s just make one thing clear; You need to shut off your brain and set it to stand-by in order to really enjoy this show. Thinking too deeply into this kind of setting, that by the way isn’t explained at all, will simply ruin the fun for you. So it is essential to just accept things as they are and instead focus on the characters. If you haven’t already played the game, getting into all of this might be a little hard as well, which is why I would recommend you to read into the game, the characters and also the different ship types before just jumping into this without knowing anything. Also, having played the game is a huge plus and I’d even say that you are only able to enjoy this show to the fullest if you have already played the game yourself or watched others play. Seriously, every episode is stuffed with references that can only be valued by those who already know about the characters, their catchphrases and simply the way things work in the game. 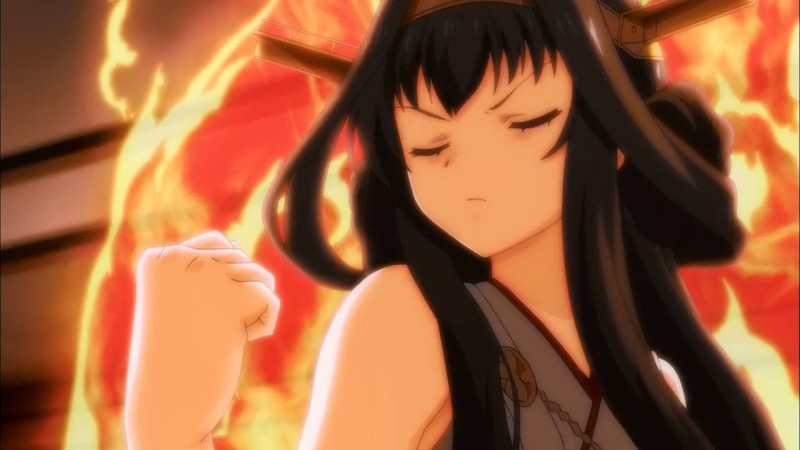 Kongou’s “Baaarnigu Laaaaaaabu” was definitely one catchphrase that I didn’t want to miss. Now moving on to the characters. This is where the show probably even deserves extra points in my eyes. I mean, I was seriously worried which characters they’d feature, which ones they’d leave out and which ones they’d set up as the main characters. Well, I can’t say I’m happy with Fubuki as the main character, even though I understand why they chose her, or in general a destroyer, the weakest and probably less valued of all ship classes. But, even with her as the main character, the selection of other fleet girls was simply superb. Showing Akagi and Kaga was already like a dream coming true, but then there were also Shoukaku, Zuikaku, Ooi, Kitakami and even the Kongou sisters… that’s just awesome. Then there’s also Mutsu and Nagato, and if we now also take into account that all characters I just listed come with numerous yuri scenes, you will hopefully understand why I am so satisfied. Well, I was missing some characters, like Suzuya and Kumano, but they already stuffed in quite a lot of other characters, and adding more would have probably made it a little too confusing, especially for those that are not yet familiar with the game. Doesn’t look confusing at all…. Finally, if you want to compare KanColle to another show, you should probably go with Strike Witches. You could say that it is an exact copy of Strike Witches, with the only difference being that the fighting doesn’t take place in the air, but on water. I know, going by my yuri rating system, I obviously rated this show too high. But in this case, I just had to add some extra points, because this show simply blew me away with the amount of yuri we got. I’m actually trying to hold back the need to post all the awesome screenshots I took during all the yuri scenes throughout the show, but I’ll refrain myself from posting too many pictures here, so if you’re interested, just check out the pictures I posted on Twitter. Some delicious Akagi x Kaga by Sleeper. Since Touhou never got a “real” anime adaptation and “only” managed to get fanmade anime projects that were either missing a real voice dub or good animation, I was seriously worried that this show might have to face similar problems. However, I was impressed just how good the whole thing looked in the end. Well, we should not forget about the awkward 3D animation that was mainly added during fighting scenes and that I already hated from other shows, like Love Live!. But in this case, I guess you can say it was bearable, since they only used it during a few selected scenes through the whole thing. The first time I listened to the opening I was really disappointed they didn’t go with one the numerous arrangements of the games’ background music. As already mentioned in my post about why games like KanColle or Touhou are so big, KanColle even surpassed the number of Comiket circles and has thus already gained a very high number of circles rearranging the music used in the game, which is also why I was almost certain they’d go with one of these for the anime as well. But oh well…. But even so, the opening, as well as the ending theme are both really great and super catchy, so I probably shouldn’t complain too much. As already stated above, this is my absolute favorite anime of the whole year. I know that some people won’t understand just why I was and still am so hyped about this show, but I can simply tell you this much: If you already know the characters from some doujinshi, and if you also play the game yourself, then this anime is seriously like a dream come true. And with yuri subtext as high as in this one, what more could I ask for? The answer is a second season and the gods have seemingly heard my prayers! Hell yeah, I’m hyped again! This entry was posted in Anime, Anime Review and tagged Kantai Collection by Lena K.. Bookmark the permalink. Maybe in season 2, Suzuya will show up and her and Hibiki can become a power couple. Y'a mean burning love, yes? I completely forgot about Nagato, so it's all good. Hibiki x Kongou x Suzuya x Nagato = my OTQ, One true quartet. Merrier the more! I've seen Love Live labeled as OT9 so you have to try a little harder than that. Aw jeez. Since you put it that way, I'll have to concede defeat on this one then. Nice review! 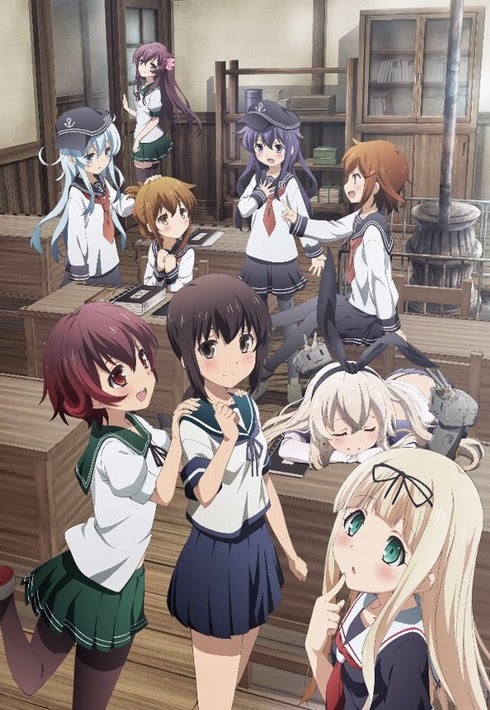 My first impression of KaneColle (not even 30 sec in) was, “So… Strike Witches but with boats?” I mean both anime are nearly the same, but I think Strike Witches handled their plot better and KaneColle minimized their “plot” 😉 more. Then again, KaneColle only had 12 episodes, whereas Strike Witches got 26 per season, even though a good chunk of them were filler. After watching the YKA finale, stuff like Kancolle just feels like junk food. It's tasty and enjoyable while it lasts, but in the end it's unfulfilling and soon forgotten. Throughout the series I could never remember the names of the two in the most overt pairing, you had the one girl with the obvious crush, the other who kinda went along with it but was also mostly oblivious to the way the other girl felt, and in the end it amounted to nothing but a bit of titillation and laughs for the few moments they appeared in each episode. Though, I enjoyed KanColle a lot more than I did Strike Witches and it's all thanks to the characters. Even though I absolutely understand what you mean, I still don't think that KanColle is really that easily forgotten, especially compared to Yuri Kuma Arashi. Well, I will say more about this in my review about YKA, but I personally liked KanColle more. looking forward to your own take on YKA gao-gao. I finally finished watching it and now I'm really afraid of how to do a review of something like this. I loved the series and I thought it would be much surprised classical and boring but I loved it. The opening and ending loved me, I can not stop listening. I know I shouldn't do this, but you were loved by both the ending and the opening? Ehhh…of course I won't hate you but I'm still going to give you a little side eye (or maybe a lot), it's not like YKA is hurting for critical praise anyways, the final reviews from The Mary Sue, ANN, and Anitay have all been extremely positive. 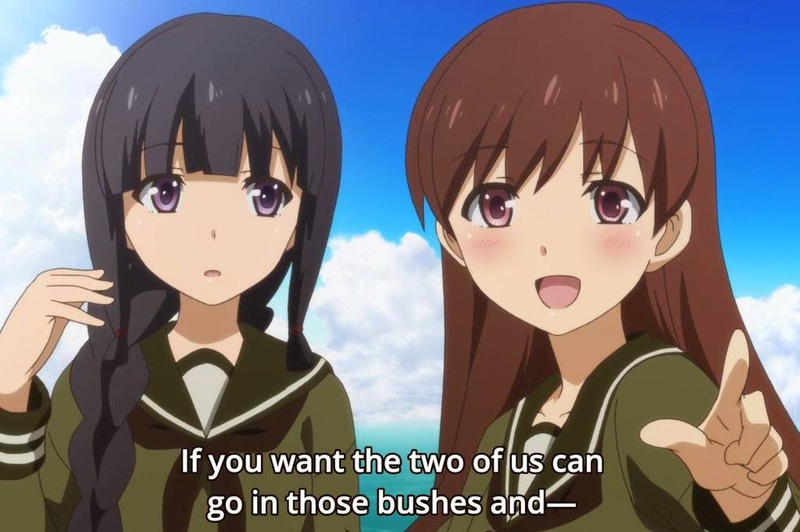 I get that YKA isn't for everyone and that a lot of yuri fans (fanboi's especially) may even hate it for what it has to say, but in my view it's a bold, and necessary step forward for the genre. I agree with what you just said about Yuri Kuma. It is something that I view as a step into the right direction for all yuri shows that will follow from this point on. However, it's really not for everyone. Like Strike Witches the show's appeal lies more in the character interactions while the battles, though cool, are secondary. I think you know who my top three pairings are. I have little to add that you haven't already other than hope the sequel's a second season, though a movie would also be nice. I never play the game (eventhough i want) but i manage to understand all the things, their catchphrases and all, thank you doujin.